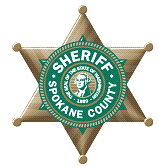 Spokane County deputy on leave for "inappropriate conduct"
An unnamed Spokane County Sheriff's deputy is on paid leave pending an investigation for "inappropriate conduct." The name of the deputy has not yet been released because the alleged victim has not been contacted, according to a news released from the sheriff's office. The allegation was reported yesterday to the Office of Professional Standards, and will be investigated by the Washington State Patrol. This story is developing, check back for details.